Ross University School of Veterinary Medicine confers a Doctor of Veterinary Medicine (DVM) degree which is accredited by the American Veterinary Medical Association Council on Education (AVMA COE), 1931 N. Meacham Road, Suite 100, Schaumburg, IL 60173, Tel: 800.248.2862. For more information please visit https://www.avma.org/ProfessionalDevelopment/Education/Accreditation/Colleges/Pages/default.aspx. Ross University School of Veterinary Medicine is currently under Probationary Accreditation with a major deficiency in one of 11 Standards, Outcomes Assessment. The DVM program remains accredited by AVMA COE while on Probationary Accreditation and therefore it will not impact current students with regard to licensure, clinical training, or employment opportunities. AVMA COE allows up to two years for the program to fulfill the directives set by the Council with regard to Standard 11. The next comprehensive evaluation will occur in 2025. Ross University School of Veterinary Medicine is accredited by the St. Christopher & Nevis Accreditation Board, Ministry of Education to confer the degree of Doctor of Veterinary Medicine, Doctor of Philosophy (PhD) and Master of Science on its students who successfully complete the course of study. The status of accreditation was renewed following submission of a self-study report and a site visit for a period of five years, effective July 1, 2017. Ross University School of Veterinary Medicine's (RUSVM) Veterinary Clinic is accredited by the American Animal Hospital Association (AAHA, www.aaha.org). The clinic provides a range of medical and surgical services for small animals, including preventive care and emergency medicine. RUSVM’s initial accreditation was granted in July 2010. The Ross University School of Veterinary Medicine's Counseling Center is accredited by the International Association of Counseling Services, Inc. (IACS, www.iacsinc.org). The North American Veterinary Licensing Exam® (NAVLE) is required for licensure to practice veterinary medicine in North America. Senior students and recent graduates must pass the NAVLE in order to gain licensure. 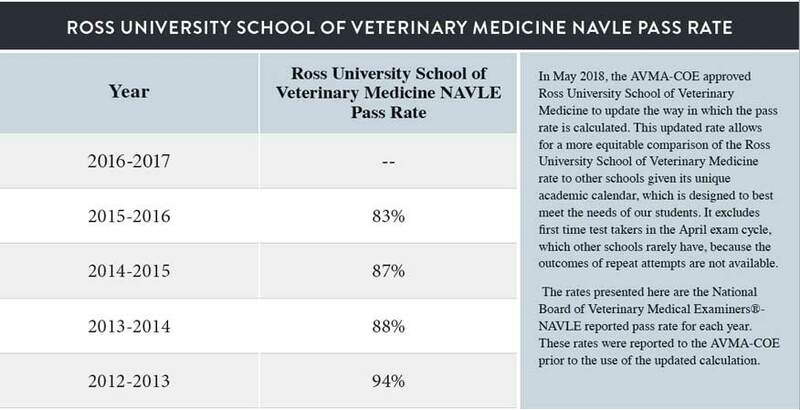 The American Veterinary Medical Association® - Council on Education (AVMA-COE) requires a minimum pass rate of 80% for the institution to maintain full accreditation and Ross University School of Veterinary Medicine students have consistently exceeded this standard. Shown to the left are the pass rate percentages for RUSVM graduates over the last five years. In May 2018, the AVMA-COE approved RUSVM to update the way in which this rate is calculated. This updated rate allows for a more equitable comparison of the RUSVM rate to other schools given its unique academic calendar, which is designed to best meet the needs of our students. It excludes first time test takers in the April exam cycle, which other schools rarely have, because the outcomes of repeat attempts are not available. To view pass rates reported prior to use of the updated calculation, please click here.